NC)- Kids love crafts, especially during the holidays. Let them help decorate the house with simple and fun crafts that the entire family can enjoy. The Bounty-ful holiday tree makes for a festive decoration and with only five steps, it’s a perfect activity for kids aged five to eight. 4. Place one green piece over the tip of the cone and attach with straight pins – just make sure the straight pins are handled with care. Then move to the bottom of the cone and attach the pieces, moving around the bottom row. Repeat, moving up to the top of the cone. 5. 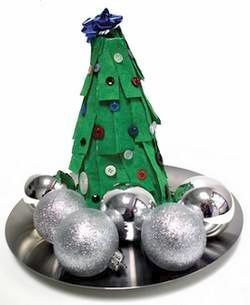 Decorate the tree with “ornaments” by attaching coloured buttons with straight pins. Pin a festive bow to the top and place the tree on Bounty paper towels for a “snowy” presentation. 6. Painting can be messy. To help with the clean-up, wipe down all surfaces with paper towels – they have the strength, absorbency, and cloth-like durability to clean up the mess with ease.